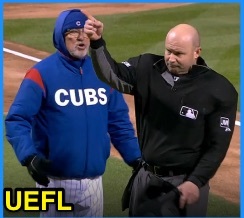 HP Umpire Mike Estabrook ejected Cubs Manager Joe Maddon (strike two call; QOCY) in the bottom of the 5th inning of the Pirates-Cubs game. With one out and two on (R1, R2), Cubs batter Victor Caratini took a 3-1 slider from Pirates pitcher Joe Musgrove for a called second strike. * Replays indicate the pitch was located over the heart of home plate and at the hollow of the knee (px 0.16, pz 1.58 [sz_bot 1.56]) and that all pitches during the at-bat were officiated properly, the call was correct.^ At the time of the ejection, the game was tied, 0-0. The Cubs ultimately won the contest, 2-0. This is Mike Estabrook (83)'s first ejection of 2019. Mike Estabrook now has 4 points in the UEFL Standings (0 Prev + 2 MLB + 2 Correct Call = 4). Crew Chief Paul Emmel now has -1 points in Crew Division (-2 Previous + 1 Correct Call = -1). *The third-inning strike call on the accompanying video is ineligible for QOC consideration pursuant to UEFL Rule 6-5-c and the "at bat immediately preceding ejection" (as well as "realistically resulted in a different outcome of the at-bat"...Caratini doubled on the next pitch). ^This pitch was located 2.232 vertical inches from being deemed an incorrect call. This is the 15th ejection report of the 2019 MLB regular season. This is the fourth Manager ejection of 2019. This is Chicago's 1st ejection of 2019, T-3rd in the NL Central (CIN 4; PIT 2; CHC, MIL, STL 1). This is Joe Maddon's first ejection since September 3, 2018 (Gabe Morales; QOC = Y [Balls/Strikes]). This is Mike Estabrook's first ejection since April 24, 2018 (Rick Renteria; QOC = N [Balls/Strikes]).